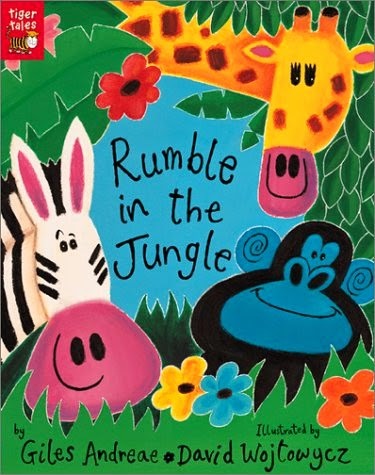 We read some fantastic books this week as part of our jungle theme preschool week. 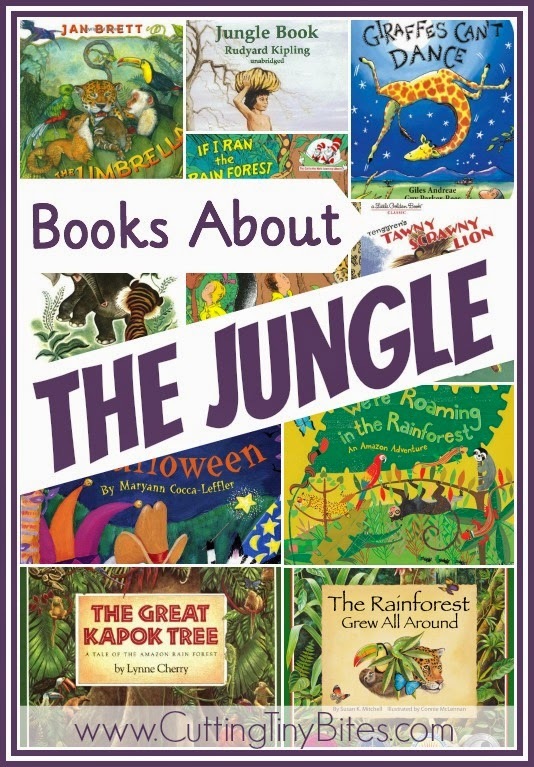 I know that the jungle and the rainforest are not exactly the same thing, but I thought they were close enough to combine them in this book list. I hope you find some reading inspiration in this list of Books About The Jungle! 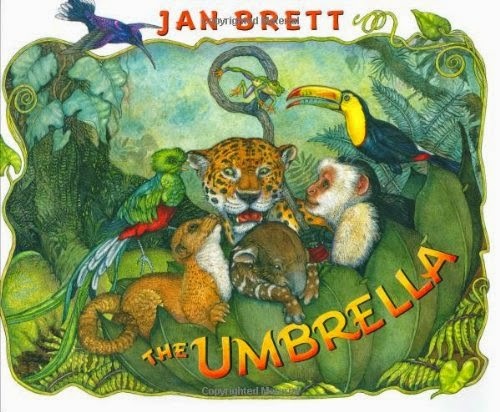 I love just about everything that I've ever read by Jan Brett. Her illustrations are so rich and detailed, and I find something new in them every time I read one. In The Umbrella, a little boy goes out to look for animals in the cloud forest. He can't find any, because they are all gathering in his umbrella that he leaves at the base of a tree. The format here is nearly identical to Brett's most well-known work, The Mitten, but it is a simple story structure that is easy for little ones to follow. This book is great for toddlers due to its simple story, and perfect for school-aged children for the detailed and cheeky illustrations. 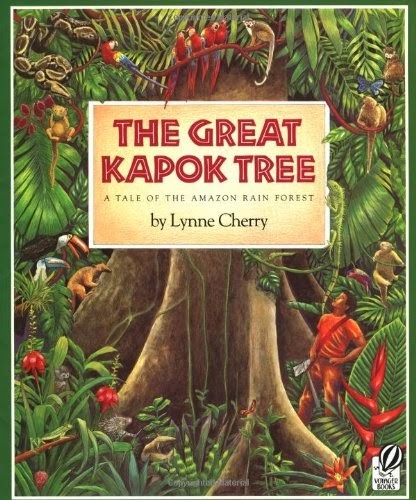 A man goes into the rainforest and starts to chop down a giant kapok tree. He gets tired and takes a snooze. Many rainforest animals take the opportunity to whisper in his ear the importance of the tree. It gives them life, provides oxygen, and is beautiful! The man wakes up and decides not to cut down the tree. This is a fairly straightforward book that can help convey a message of conservation to young children. My toddler lost interest in this book since it was a bit long, but my preschooler loved it. The realistic illustrations help to show the true beauty of the rainforest. There is also a map in the front that shows where the rainforest is, and has all the rainforest animals crawling around the border. This is one of our favorite little board books. 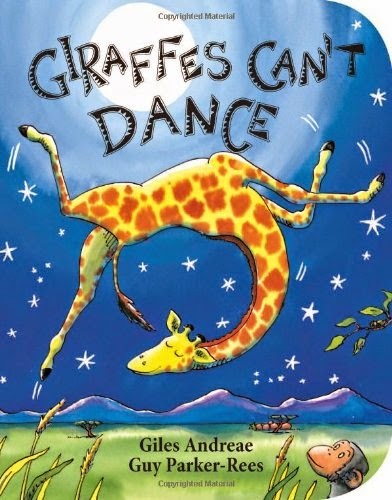 A giraffe (name Gerald) is mocked by his jungle friends for his inability to dance. After sulking away form a dance party, he discovers that he can, in fact, dance-- he just needs a different kind of music. This book is about loving yourself for your own unique talents, a lesson that is important for us all to remember. 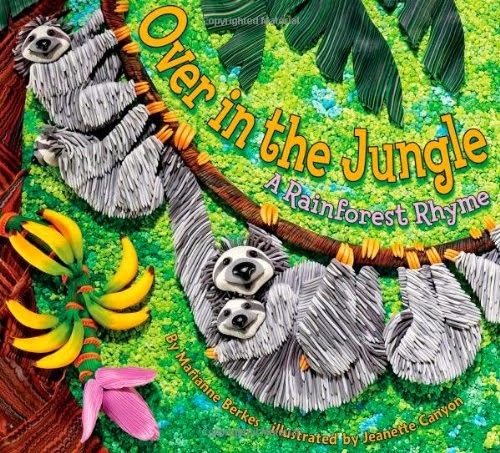 While there's nothing informative about the jungle in this book, it is super cute and is highly recommended for your preschooler or kindergartner. 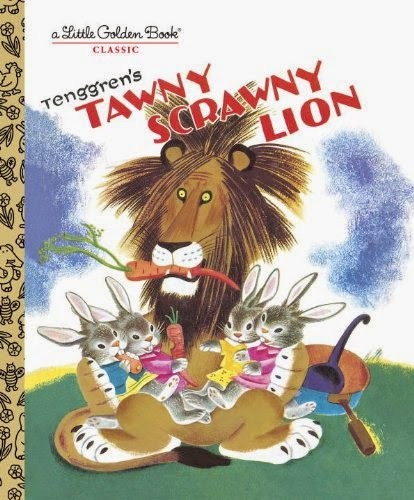 The Tawny Scrawny Lion is a classic Little Golden Book that should be on your shelves. A hungry lion chases all the jungle animals and wants to eat them. The animals send a little bunny to talk to him to get him to stop. The friendly bunny feeds him delicious carrot stew which he loves, so he decides to stop chasing and eating the other animals. My only problem with this book is the description of the "fat little bunny" over and over again, but I just leave out that word! This book is appropriate for toddlers, preschoolers, and early elementary aged children. 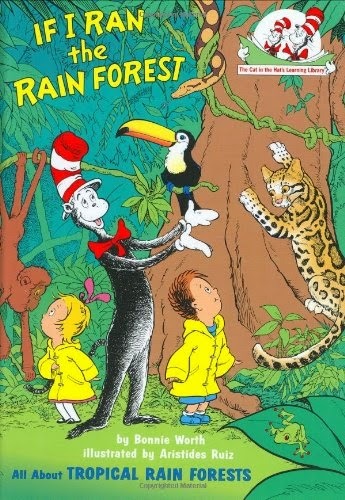 Another great book from the "Cat in the Hat Knows a Lot About That" series! These books are all packed with great information, aimed at a preschool or kindergarten level. Using characters that children are familiar with can make learning more fun and accessible. This book discusses the different 'layers' of the rainforest by comparing them to elevator stops. Lucy Cousins is best known for her little mouse character, Maisy. 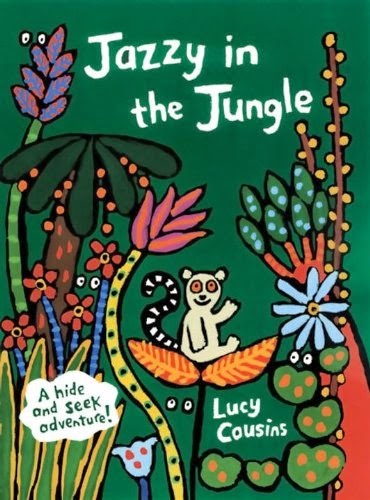 In this book, a little lemur plays hide and seek in the jungle. This one is great for babies and toddlers. There are die cut pages that allow certain things to peek through as you read. Your little ones will love slowly revealing the jungle scenes. The text is quite repetitive (great for babies) and the black outlined drawings provide high contrast for little eyes. This is such a cute book that your kids will be begging you to sing/read over and over again. It is written to go to the tune of "Over in the Meadow" (you can find it on YouTube if you're not familiar with it) and goes through 10 jungle animals and their babies. In addition to being such a catchy tune, this is also a counting book. Each animal parent has a certain number of babies, so you can help your little ones find and count the animals on the page. The final page is a big spread with all of the featured animals, which your kids can "search and find" on. 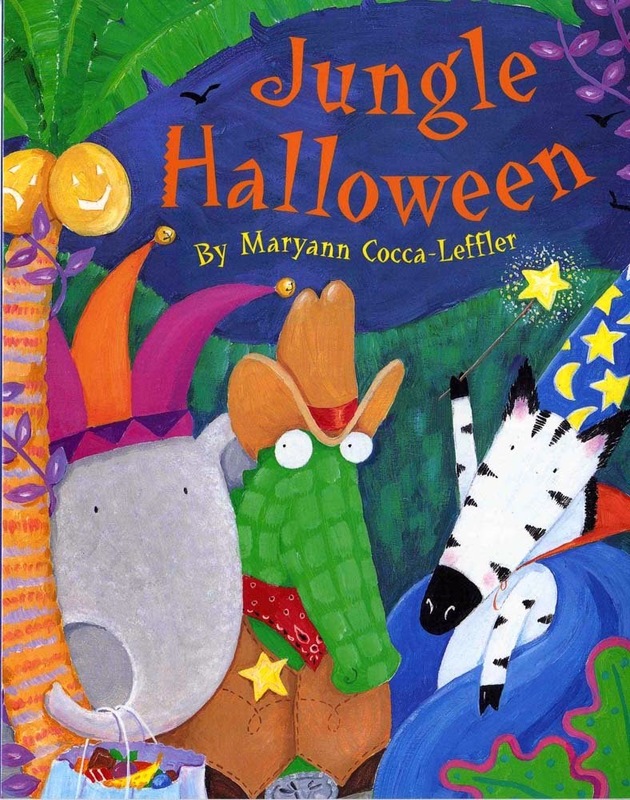 Jungle Halloween is a good choice for young toddlers (and would do double duty as a Halloween book, too!). The animals in the jungle get ready for Halloween. Simple enough! The text is simple, and the pictures are bright and simply drawn. This is a fantastic alphabet for all ages. The basic text is a rhyming alphabet sequence, but along the borders of the pages are very detailed information about the animals and other things being discussed. You could read just the alphabet part to your young children, and read the more detailed information to older children. The illustrations are very realistic. Like most houses with young children, there is a lot of Eric Carle on our shelves! 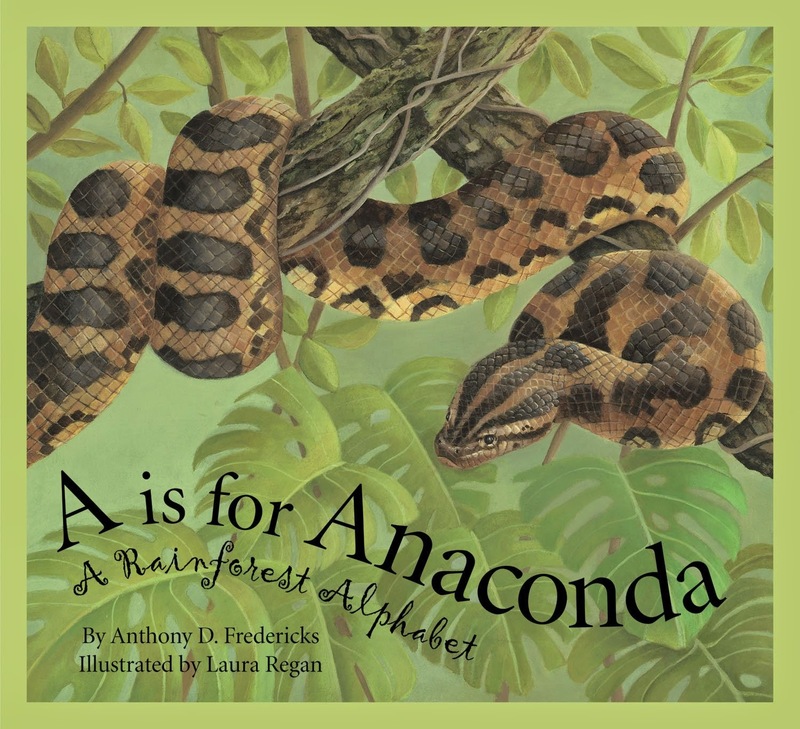 This book features his distinctive artistic style, focused on jungle animals. 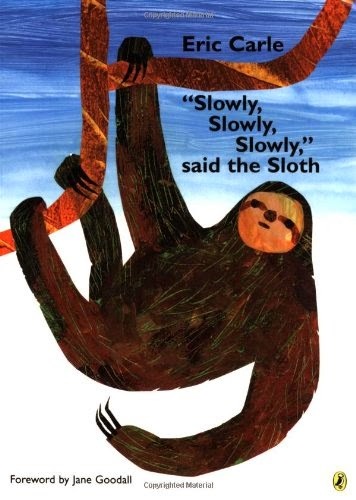 Everyone wonders why the sloth is so slow! It also includes a great little vocabulary lesson at the end. Parents and kids alike can benefit from this lesson about slowing down a bit. Toddlers and preschoolers would enjoy this book. This is a cute collection of poems about jungle animals. The drawings are bright and attractive for young children. Each poem is short and clever. This is a fun book for older babies, toddlers, and preschoolers. You could even have your child memorize some of the poems! Children's book list of jungle books. Reviews of each. Choices for babies, toddlers, preschoolers, kindergarten, and elementary aged kids.